Having crafted and refined your mix, join the growing number of professionals who’ve chosen the Oxford Limiter v3 to deliver maximum loudness, density and presence - whilst retaining the kind of clarity and transient detail that conventional brick-wall limiting can’t. The Plug-In is a true peak limiter that offers recently enhanced levels of processing and metering accuracy. The result is that you get to see and automatically correct otherwise invisible reconstruction overloads - and conform to the accepted industry ITU-R BS.1770-4 standard. Whether you’re after the Oxford Limiter's hallmark transparency or heavier creative effects, its advanced look-ahead processing and unique Enhance function provide the sample-value limiting and musical boost needed to reliably avoid clipping and confidently increase apparent loudness. The price of the v3 Limiter hasn’t changed from that of the original Plug-In and the upgrade is free to registered users of the Native/HDX Generation 5 (G5) products. If that’s you, then download the new installer here. 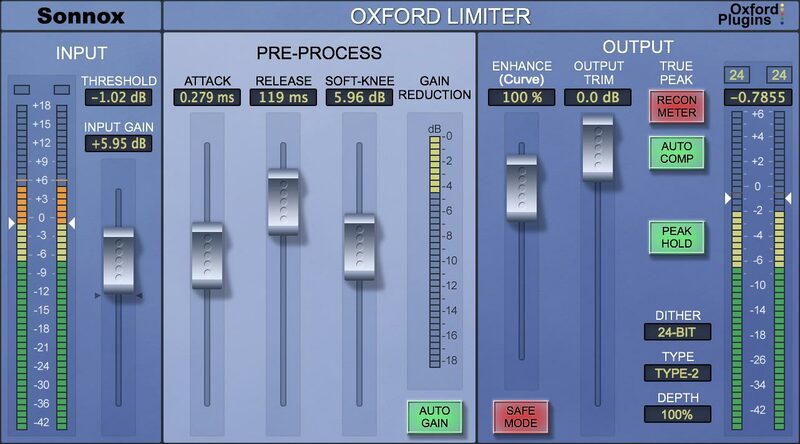 The Oxford Limiter is also available in the following money-saving bundles. "...a must-have for mastering studios." "I couldn't believe how sweet it sounded on everything." "...allows high degrees of limiting, while preserving detail." The Sonnox Oxford Limiter v2 plug-in is on everything I do – I can’t live without it!